Yesterday, under the full glare of the sun and at the day’s peak of the heat we have been experiencing, I ended up standing on hot asphalt in a parking lot having a debate with a Democratic friend about the party’s prospects in November. When we encountered each other, she’d asked a general question about my opinion of party prospects this November, and I’d started my answer with a concern about where progressives stand in all of this – i.e. virtually no progressive position has been forwarded since the last congressional election. 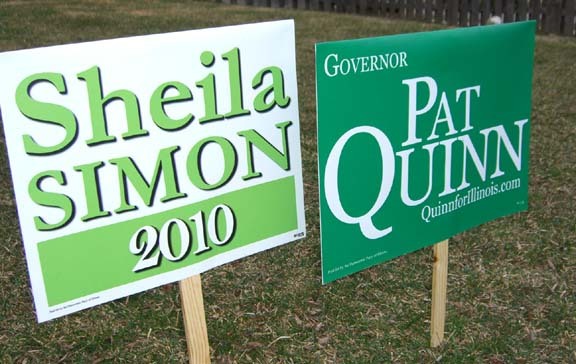 By now most political insiders already know that green yard signs will read, Quinn-Simon for the November 2010 election cycle. My perspective on the selection process might be slightly different from others, so, I decided to pen my own version. I covered the initial candidate selection process last week. Krishnamoorthi supporters were shivering in the cool morning air when we arrived at The Inn in Springfield around 9:35 a.m. on Saturday morning. These were the only campaigns that seemed to mobilize supporters. In advance of this morning’s event, I only know of three candidates who were working phones up until the last minute to get votes. Sheila Simon and Dirk Enger were calling all committeemen and Raja Krishnamoorthi seems to have invested about six weeks of time calling, e-mailing and snail mailing all of the 38 State Central Committee (SCC) members, was still calling for support. Is Sheila Simon Governor Quinn’s top pick for Lt. Governor? This afternoon I received a call from Sheila Simon, one of the 16 finalists in the Lt. Governor selection process. Simon said that she was one of Governor Quinn’s top picks and wanted to know if that would influence my vote. I told her that the Democratic Party needs to restore some integrity and go back to being a party that lives up to our promises. That being said, I’ve already given my word to Dirk Enger that I would nominate and support his candidacy. I have been around long enough to put two and two together and it would not surprise me if Governor Quinn will announce his support for Sheila Simon tomorrow. Governor Quinn has indicated that he will weigh in regarding his preference in this matter before Saturday and Mike Madigan has stated that he would honor Quinn’s wishes. On Saturday, March 20th, I took careful notes while attending one of the six public forums used to select a Democratic Lieutenant Governor. I was at the Bolingbrook location, where 20 of the 40 anticipated applicants showed up to audition. As a political activist and candidate, I have been to literally hundreds of coffees, fundraisers, rallies, press conferences and political events as part of the grueling process of running for public office. 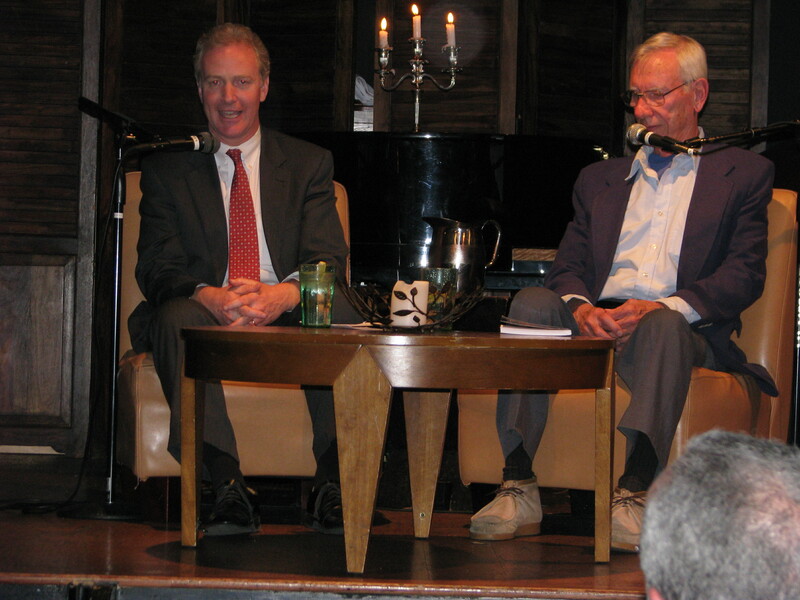 Based on this experience, I think I can state with some authority that the first-round selection process used to vet potential candidates to be Governor Quinn’s running mate brought out the best candidates I have ever seen in a room full of people seeking public office. I want to thank everyone who voted to elect me as the Democratic State Central Committeewoman for Illinois’ 14th District in this past February 2010 election. If you voted for my opponent because you liked her platform better than mine, I would like to hear some of those ideas and I want you to know that I am also here to serve you. 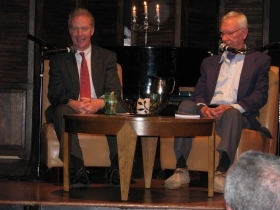 When I ran for this seat, I had no idea that I would be in a position to help select the next Democratic nominee to run for Lieutenant Governor in Illinois. After Scott Cohen won the nomination on February 2, a past arrest record was used to pressure him to step down. This decision by Mr. Cohen puts the 38 Democratic State Central Committeewomen and Committeemen in a unique position to help slate the Democratic nominee to run on the ticket with Governor Quinn.